She was lonely, sad and hurt, trapped in the rigid etiquette that existed in all royal courts of that time including Saxony. What made it even more unbearable was that she was under constant scrutiny and under observation from the royal family members. Her attempt to flee this situation created a scandal that was followed by the press to the last detail. Louise from Austria-Tuscany, the wife of the Crown Prince Fredrik August, the last King of Saxony outraged everyone when she had a romantic liaison and fled the royal court. This decision, to leave her husband and children, was to have lifelong repercussions that she must have regretted later. She died in poverty as a flower lady in Brussels. On the occasion of her 70th death anniversary of the lady, who caused the most celebrated drama in the Saxon Court, Schloss Pillnitz is holding a special exhibition this year. New sources from the National Archives in Prague, which were discovered on the occasion of another exhibition in the Czech Republic have shed new light on the events and legends of that time and made it possible to understand them from a new perspective, in particular about her private sphere and her motivations. This material was never available to the public before. It supplements the picture painted by the official documents in the Saxon State Archives, the press articles and Louise’s autobiography. The numerous spy reports on her filed in the Police Headquarters lend her story a grim aspect. The paintings and photographs of the family, her postcards, letters and private correspondence bring it alive. Schloss and Park Pillnitz have brought a bit of India to Saxony with their special theme this year and will adorn their gardens with a veritable sea of flowers. The project began with the search for the trail of an almost forgotten apprentice from Saxony, who joined Pillnitz to learn how to be a gardener. After being stationed in North Germany, later England, he finally arrived in India to prove his mettle as a designer of gardens. Born in 1865 in Lohmen, not far from Dresden, Gustav Hermann Krumbiegel left his home as a young lad to study in the most renowned of botanical gardens of London and Europe. Responding to an enquiry from India, then a colony of Britain, he took up the post of „Superintendent of Government Gardens and Museum“ in Southern India. The Palace Gardens of Mysore und Bangalore flourished under his care as well as the development of landscaping and farming. He chose to remain in India for the remainder of his life, dying at the age of 91 years in Bangalore. He is buried there. An exhibition on his life and works was inaugurated on the 29th April, in the New Palace in Schloss Pillnitz, on the occasion of the 150th anniversary of his birth. On the 1st June this will be extended into the park which will explode into colour. Exotic plants, shrubs and palms will appear alongside carpets of flowers, flower covered stairs, and peacock shaped sculptures of flowers. Visitors can avail of the various exhibitions and events and allow themselves to be enchanted as well. Exhibition: The Maharaja’s Gardener. A Saxon enchants India. 4./5. June: A week of celebrations. Inaugration of the garden exhibition with Indian dance, music and short tours. 29. October: Diwali. Pillnitz celebrates the traditional Indian festival of lights, closing the topical year. The Park of Pillnitz, situated in the suburbs of Dresden and famous for the old summer residence of the Wettin dynasty and a botanical garden, is going to charge an entrance fee, starting on 2nd April 2012. The day ticket, so called ‘Garden Ticket’, will cost 2.00 EUR p.p. and includes the entrance to the park as well as the entrance to the palm house (reduced entrance fee 1.00 EUR p.p., group entrance 1.50 EUR p.p., children under 16 years are free). The best and most beautiful way to get to Pillnitz is a cruise on the Elbe River. The Saxon Steamboat Company starts its season on 5th April. There are several tours that include a stop at the Pillnitz pier: the Castle Cruise to Pillnitz, the new National Park Line (from Pillnitz to the Saxon Switzerland) and the Elbe Valley Line (Dresden to the Saxon Switzerland). 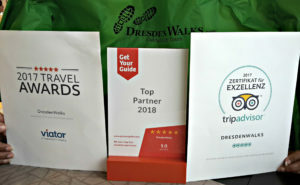 We would like to suggest you to combine a guided walking tour through the Old Town of Dresden with a visit to Pillnitz. Enjoy the wonderful Dresden Elbe valley on a historical steamboat cruise after our walking tour. DresdenWalks is able to offer a special combo tour in cooperation with the Saxon Steamboat Company. Our daily walking tours start at 11 a.m. at our green signboard on Schlossplatz square. DresdenWalks - we are not just 12 tour guides who simply show visitors the city every day. We would also like to give you reading material about Dresden and Saxony. That is why we blog here about current events such as festivals, building projects and art, as well as historical events, personalities or simply the things that are close to our hearts.